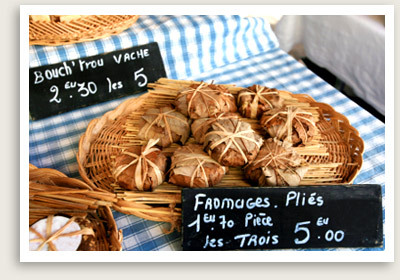 Cooking Class in Provence Includes: Guided market tour, ingredients for meal, private cooking class with local chef. Locations: Alpilles, Luberon, Avignon and Vaison la Romaine areas. Avignon, Arles and vicinity; Aix, Marseilles and vicinity. Other departure points available, please inquire. Note: This private cooking class in Provence designed for visitors (generally four-person minimum) whose accommodations have a private and fully equipped kitchen. More upscale small group classes, which take place in four-star restaurants and hotels, are also frequently held; please let us know your dates of interest and we can inquire for you. Kids’ cooking classes and afternoon pastry classes also available. This tour can be expanded into a full-day tour to include sightseeing. You will begin your private cooking class in Provence with a visit with your chef-guide to a local market to select fresh ingredients (the market visit is great for improving your French as well as your culinary vocabulary). You will then return to your private kitchen, and get cooking! You can learn how to make the hearty French Ratatouille, a traditional Aïoli, or the special Bouillabaisse from Marseilles. After your cooking lesson, you will get to savor the fruits of your labor with the chef.